Fort Ridgely was built in 1851. It wasn't much of a fort though, but it was the only military post between the Sioux Reservations and the settlers. On August 18, 1862, the Lower Sioux Agency was attacked. About 67 whites were there. Within a few hours 20 had been killed, and 10 captured. The remaining 47 reached fort Ridgely. Mr. J.C. Dickinson led his family in a wagon to Fort Ridgely, nobody believed him. Several more settlers came, convincing Captain John S. Marsh, Company B, fifth Minnesota, that the Agency had been attacked. Marsh ordered Drummer Charles M. Culver, a twelve year old (who would die in 1943, at 93, as Company B's last survivor) to beat the long-roll. About 74 men fell in. The men were Captain Marsh, Second Lieutenant Thomas P. Gere, about 4 sergeants, 7 corporals, and about 62 privates. Marsh chose 46 men, along with Indian Interpretor Peter Quinn, to go with him. They saw many dead. 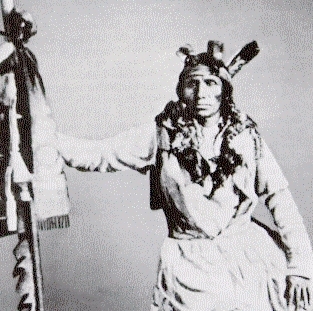 Quinn was one of the first killed by Chief White Dog, along with a quarter of the men. By 4:00 P.M. Marsh had eleven men in his command and twenty-four had been killed, 14 left. Marsh wanted to swim across, carrying his revolver and sword. Marsh was a strong swimmer, but two-thirds of the way across he had to swim. He was seized by a cramp and shouted, "Cramp." Sergeant John F. Bishop, the ranking officer, ordered Privates John Brennan, James Dunn, and Stephen Van Buren to save Marsh. Brennan reached Marsh. Marsh grabbed Brennan's shoulder for dear life but fell off. Marsh drowned and the men saw Marsh's body floating in the river. He was about 28 when he died. (See Battle of Redwood Ferry.) Sergeant Bishop led the eleven back to safety. One man was so shot up he had to be carried. They arrived between 10:00 P.M. and 11:00 P.M. that night. 10 other survivors eluded the Indians and snuck back to Ridgely. The Battle of Redwood started a siege. Description: In August 1862, the Santee Sioux of Minnesota under Chief Little Crow, angered by the failure of the Federal government to provide annuities and by the poor quality of rations, went on the offensive. They killed approximately 800 settlers and soldiers, took many prisoners, and caused extensive property damage throughout the Minnesota River Valley. Fort Ridgely, about twelve miles from the Lower Sioux Agency, became the refuge for white civilians. The fort’s commander, Capt. John S. Marsh, set out with most of his men for the Lower Sioux Agency. Before reaching the agency, a large Native American force surprised the soldiers, killed half of them, including Marsh, and pursued the survivors back to the fort. On August 20, about 400 Sioux attacked the fort but were repulsed. On the 22nd, 800 Sioux attacked the fort again, but the garrison and civilians held the fort.